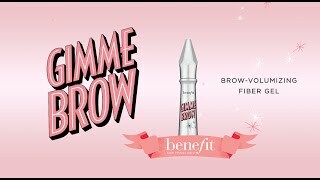 How will Gimme Brow transform your look? See for yourself...with our new virtual Brow Try-On! Check out the product payoff on your brows and find your perfect shade. What is the difference between new & old gimme brow shades? Hi gorgeous! Gimme Brow is our GO TO brow product! We didn't change anything about our existing shades or formula. Our light/medium shade is now #1. Our NEW shade is #3 it has a warmer undertone for those Browbabes who couldn't wear the other shades and our medium/deep shade is now #5. Can I use Gimme Brow on my eyelashes? Hi gorgeous! it is only tested for your eyebrows, I would not recommend using on your eyelashes! Hi gorgeous! Our Gimme Brow is water resistant.